New Horizons is a NASA spacecraft that was the first to visit dwarf planet Pluto in July 2015. Its pictures of the dwarf planet's icy surface, as well as observations of Pluto's moon Charon, are revolutionizing our understanding of solar system objects far from the sun. The mission is now en route to an object deeper in the Kuiper Belt, called 2014 MU69. It will reach this object on Jan. 1, 2019. Pluto's distance — about 3 billion miles (5 billion kilometers) from Earth — presented power challenges for New Horizon's designers, since the sun's rays are too weak to generate power. There are also long communications delays for those staying in touch with the 1,054-lb. (478 kilograms) spacecraft; at Pluto, it took 4.5 hours for a one-way message to get there from Earth. Further, our understanding of the Pluto system keeps changing. Astronomer Clyde Tombaugh discovered Pluto in 1930 at the Lowell Observatory. (New Horizons carries some of Tombaugh's ashes.) Since then, we've discovered new moons around Pluto — which can also be seen as dangerous obstacles for a spacecraft, if not accounted for. There are also ongoing debates about whether Pluto is a planet or not. The International Astronomical Union voted to change its status to "dwarf planet" in 2006, following the discovery of several similarly sized objects in the Kuiper Belt. However, New Horizons principal investigator Alan Stern has repeatedly said he is not in favor of the decision — especially after the flyby revealed more a more complex formation history than initially anticipated. In 2017, a group of planetary scientists submitted a proposal to reclassify Pluto as a planet at the 48th Lunar and Planetary Science Conference in The Woodlands, Texas. This is a montage of New Horizons images of Jupiter and its volcanic moon Io, taken during the spacecraft’s Jupiter flyby . The image was released in Oct. 2007. New Horizons was initially selected for funding in 2001, but was excluded from the NASA 2003 budget. Funding for the mission was reinstated after New Horizons was listed as a top priority in the Planetary Science Decadal Survey of 2003–2013, which identifies scientific targets for future exploration. Spacecraft typically have a set design lifetime, similar to warranties on electronics or cars. Over time, solar particles, cosmic rays and other phenomena can degrade the surface of the spacecraft or mess up the electronics. This makes long missions such as New Horizons especially challenging, requiring backup systems and a source of power (nuclear power) to keep the spacecraft alive far away from the sun. New Horizons launched Jan. 19, 2006, on an Atlas V rocket from Cape Canaveral Air Force Station in Florida. A power outage and high winds delayed two previous launch attempts, but New Horizons made it safely into space on the third try. The spacecraft's first destination was Jupiter, in February and March 2007. New Horizons passed by less than 1.4 million miles (2.4 million km) of the solar system's largest planet, making it the first spacecraft to swing by since the Galileo probe finished its mission at Jupiter in 2003. Among New Horizons' first pictures were some of Io, Jupiter's volcanic moon. The spacecraft captured the clearest pictures ever of the Tvashtar volcano on Io, showing volcanic fallout that was bigger than the state of Texas. Additionally, the spacecraft flew through a stream of charged particles swirling behind Jupiter. It found large bubbles of charged particles, or plasma, and also revealed variations in the stream. At the time, astronomers said the observations could help with understanding the environment around "hot Jupiter" planets found at other stars. To conserve energy and lessen the chance of anything breaking, controllers kept the spacecraft in hibernation save for periodic wakeups for navigation and systems checks. It emerged from hibernation in December 2014 to get it ready for the Pluto encounter and sending data back to Earth afterwards. New Horizons was so busy gathering data in its July 2015 encounter that, as planned, the spacecraft didn't communicate with Earth during its closest approach to Pluto and Charon. Controllers celebrated when New Horizons phoned home and they knew that data was on the way. Early pictures from New Horizons showed a surprisingly young surface, with a mountain range on Pluto as high as 11,000 feet (3,500 meters). Believed to be about 100 million years old at most, this range likely pointed to recent geological activity on the surface, but how was a mystery. "This may cause us to rethink what powers geological activity on many other icy worlds," said John Spencer, New Horizons geology, geophysics and imaging team deputy leader, in a statement shortly after the encounter. More youthful terrain — a huge plain bereft of craters, just north of the mountainous range — popped up in pictures sent back in mid-July. The zone has been informally named Sputnik Planum and is a region of intense scrutiny, given that geologists are still trying to figure out what caused this. This high-resolution image from New Horizons shows the “shoreline” of Sputnik Planum on Pluto. Some of New Horizons' other scientific discoveries included evidence of a past subsurface ocean on Charon, and strange water ice hills on Pluto floating in frozen nitrogen. In 2018, one study suggested there may be an asphalt layer on Pluto, just beneath its surface. Some scientists have also suggested that Pluto could have the ingredients for life on its surface, even at its great distance from the sun. Ten years can be a long time in planetary science, and that is particularly true of Pluto. Since New Horizons left our planet in 2006, we've discovered another moon near Pluto. Planners have made course corrections to keep the spacecraft away from Pluto's moons. Further, Pluto was demoted from its position as the ninth planet in our solar system. In August 2006, members of the International Astronomical Union (IAU) — the global body that governs astronomy names and other matters — met in a general assembly to decide on the definition of a planet. This vote was called in response to the recent discoveries of large bodies in the Kuiper Belt, an area beyond Neptune believed to contain trillions of objects. 1.They must orbit the sun (and not another body, as a moon orbits a planet). 2.They must have enough mass to form a round shape. 3.They must be large enough to clean out bits of rock and other matter in the area around their orbits. Pluto didn't meet all the classifications, and was reclassified as a dwarf planet. The decision drew fire from Alan Stern, the principal investigator of the New Horizons mission. "I'm embarrassed for astronomy. Less than 5 percent of the world's astronomers voted," he said in a 2006 interview with Space.com. "This definition stinks, for technical reasons." In 2017, Stern and other scientists announced plans to redefine Pluto (and other objects) once again as planets, based on the complexity of Pluto's terrain and formation history. A presentation was made at the 48th Lunar and Planetary Science Conference in The Woodlands, Texas. The proposal redefined a "planet" as a round object that has never experienced fusion (unlike a star); it is expected to encompass not only dwarf planets, but also moons. Pluto's status, however, still remains officially as a dwarf planet as of early 2018. Dwarf planet science also continually changes as more observations are gathered. The IAU officially named only five dwarf planets: Ceres, Pluto, Eris, Haumea and Makemake. Other astronomers, however, argue that other small bodies should be added to the list based on their physical characteristics; these include Sedna, Quaoar, 2012 VP113, and DeeDee. Investigators have also recently discovered moons circling dwarf planets, such as Makemake and "Snow White" (more formally known as 2007 OR10). Over the Northern Hemisphere summer of 2014, investigators used the Hubble Space Telescope to see if there were any Kuiper Belt objects within reach of New Horizons after it concluded its Pluto mission. Scientists identified three candidates, with each of them at least 1 billion miles (1.6 billion km) beyond the dwarf planet. With NASA approval in 2016, New Horizons' mission was extended to take a closer look at one of these worlds, a Kuiper Belt object dubbed 2014 MU69. The New Horizons team is now determining how to operate the scientific instruments during the flyby, and the best way to orient the spacecraft as it goes over. The flyby distance has not been determined as of May 2017, but it is expected to be somewhere between 3,000 and 20,000 kilometers (1,875 to 12,500 miles). 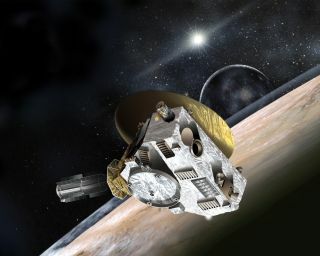 In September 2017, New Horizons concluded a planned five-month hibernation period in preparation for its extended mission. (Putting a spacecraft into hibernation saves on power and other resources, allowing spacecraft to operate longer in space.) Until December of that year, New Horizons took several objects of Kuiper Belt objects. In December 2017, NASA's New Horizons team announced that 2014 MU69 might have at least one moon. Investigators discovered the possible planetary companion after the object occulted stars on June 10 and July 17. Observatories examining the object found that it wasn't sitting in its expected location in the sky, and that it had an unusual, bi-lobed shape. These observations both suggest that MU69's location has offset from its center of mass, hinting that there is at least one moon nearby. Notably, some of New Horizons' 2017 photographs included images of objects 2012 HZ84 and 2012 HE85. Given New Horizons' great distance from Earth (3.79 billion miles or 6.12 billion kilometers from Earth), the spacecraft's images were the farthest photos ever captured by a spacecraft flying from Earth. The previous record was held by Voyager 1, which took the famous "Pale Blue Dot" image of Earth on Feb. 14, 1990, from 3.75 billion miles (6 billion km) away. Depending on how much fuel New Horizons uses for its encounter with 2014 MU69, it may have enough juice available to fly by yet another Kuiper Belt object. In September 2017, Stern told the Outer Planets Assessment Group (OPAG) in La Jolla, Calif., that he expected the mission had a "fighting chance" of encountering another object. The team was searching for other possible flyby targets, although the primary focus remained the upcoming flyby of 2014 MU69. Meanwhile, even after the mission ends, a group of scientists, artists, engineers and more are proposing placing a sort of message from Earth on the free hard drive space on the New Horizons spacecraft. "When New Horizons gets past Pluto, [and] has done all its data and is going on the slow boat to the heliopause [the boundary between the solar system and interstellar space], then it might be possible to just reprogram about 100 megabytes of its memory and upload a new sights and sounds of Earth that are not created by a small group of scientists but, in fact, are globally crowdsourced," said Jill Tarter, who is the co-founder of the SETI (Search for Extraterrestrial Intelligence) Institute, in 2013.